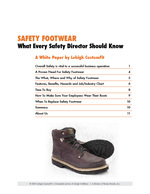 Our team of safety footwear experts share their years of knowledge, wisdom and research to help define, answer and resolve questions and issues that relate to your safety footwear program, job, home and and community. 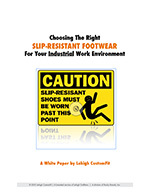 Do You really need slip-resistant footwear? Types of work environments, statistics, standards and regulations to help you know what's best for you. If you work with chemicals, solvents, acids, fats, detergents, oils, fuels, etc. 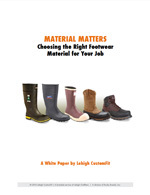 you need to know what footwear materials hold up and protect you and what don't. Complete the below form to access our library of white papers.